A collective ‘bad day at the office’ from Brynley Toms and his Bedwas teammates was enough to ensure that Aberavon (who handled the conditions much better than the home side) went home with the win 19 – 5. 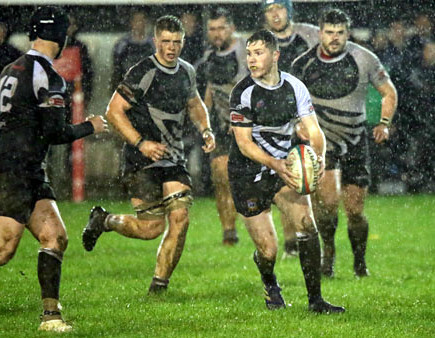 Heavy rain in the afternoon until half time of the game was a contributing factor but Bedwas simply didn’t manage it as well as their opponents dropping many passes in midfield and indiscipline at times proved their nemesis. Aberavon dominated possession early on and took the lead after a quarter of an hour as Number 8 Ashton Evans crossed for an unconverted try. Bedwas tried to get back into the game but handling errors and the intervention of the referee starved Bedwas of any chance of gaining any momentum. Their efforts were not helped by a harsh yellow card given to Adam Williams for a deliberate knock-on when attempting to intercept an Aberavon pass. Aberavon held all the aces upfront and pack power earned them their second try on half time as after a series of close range scrums the Bedwas pack was shoved back sufficiently for the referee to award Aberavon a penalty try. With the rain stopping during the half time interval and the wind at their backs the Bedwas faithful hoped that twelve points would not prove too big a deficit. However Bedwas continued to be the architects of their own demise as handling errors continued to frustrate. Aberavon’s dominance at scrum time and after a series of scrums which saw Bedwas struggle the referee ran out of patience and sent Toms to the sin-bin; the last thing a side under pressure in the tight needed. Bedwas sacrificed winger Kane Teear-Bourge to bring on Sam Cochrane at prop but at mattered little as shortly afterwards the referee awarded Aberavon a second penalty try. The introduction of Chris Budgen after around 65 minutes briefly shored up the Bedwas scrum and finally Bedwas were able to gain some possession in the visitors half. A catch and drive from a line out was illegally stopped by Aberavon with one of their players sin binned and from a second line out a successful catch and drive was executed by Bedwas with Chris Budgen the try scorer under a pile of bodies. It was too little too late for Bedwas as Aberavon were able to maintain their dominance and hold on for the victory.